Today I'm sharing my first card created for Sentimental Sundays.....YEAH!!!! Today's challenge is to create something that is inspired by a song and you most included a sentiment. I have to admit.....this was a mind boggling challenge for me. This was my first time creating anything that was inspired from a song. I started out making a layout....but for some reason, I couldn't find the appropriate place to place a sentiment. To top all that off, I couldn't find a sentiment for the layout!!! AHHHHHH.....I was panicking.....I could not be late for my first posting I kept thinking!!! So sitting there looking at all my stamps on the peg board and the iPod player playing.....BAM!!! Her voice echoed through the speakers and I saw the stamp stamp set I was going to use. With the song playing on repeat......This is the card I came up with using Mojo's Monday Sketch #193. I think the card came out pretty fabulous!!! Wait til you see what the rest of the DT came up with. You are going to love it and I hope that you find some scrapping time to join us this week. And I am trying really hard to use my scraps and not leave them lying around unused. 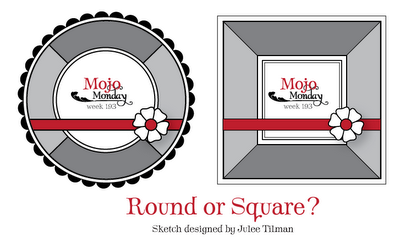 So with that said I made another card using the the round version of Mojo's Sketch!! I am pretty proud of myself for doing that.....Now if only I can do that every time I have scraps, I wouldn't have so much scrap pieces!!! Oh yeah, pretty fabulous girl!! Your dp is gorgeous, love that stamp. I love sketches where I can use my little scraps, I have soooooo many, lol! You're definitely right there Calypso - this is card is certainly pretty fabulous - I love it! Great that you are using up your scraps to such great effects! Thanks for playing along at Card Makin' Mamas! Oh wow! You are so rockin' the inspired by song challenge! I love your card(s). The color combo is fabulous. I never would have thought to put these together but they look great. I am adding to my "idea" book. Love those colors together and kudos to you for using up some scraps! Thanks for joining in this week at Paper Sundaes!